Fall officially marks the start of trying to boost your immune system, in the hopes you won’t get an awful cold or the flu during the holidays and winter months. We step up our efforts to eat better, sleep more, exercise and give extra consideration to washing our hands more often! 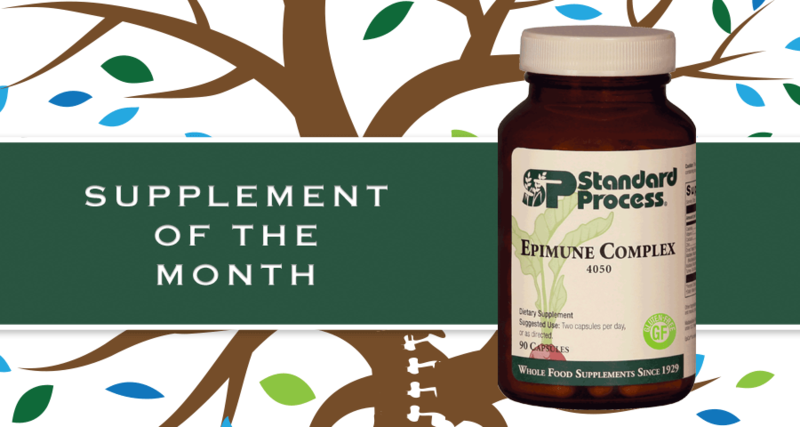 This month’s featured supplement is Standard Process’ Epimune Complex. It’s a vegetarian, Gluten-free immune system support designed to balance immune system response function*. Epimune Complex is high in antioxidant vitamin C* and includes calcium and zinc. It also contains research-supported ingredients such as EpiCor® and maitake and turkey tail mushrooms, which are immune boosters. If you would like more information about Epimune Complex, or seek other nutritional advice, please call 410-876-8885 and make an appointment with Bio-Wellness with Dr. Greg. At Lewis Family Chiropractic & Wellness Center, we firmly believe that nutritional supplements should be customized to meet each patient’s specific needs.